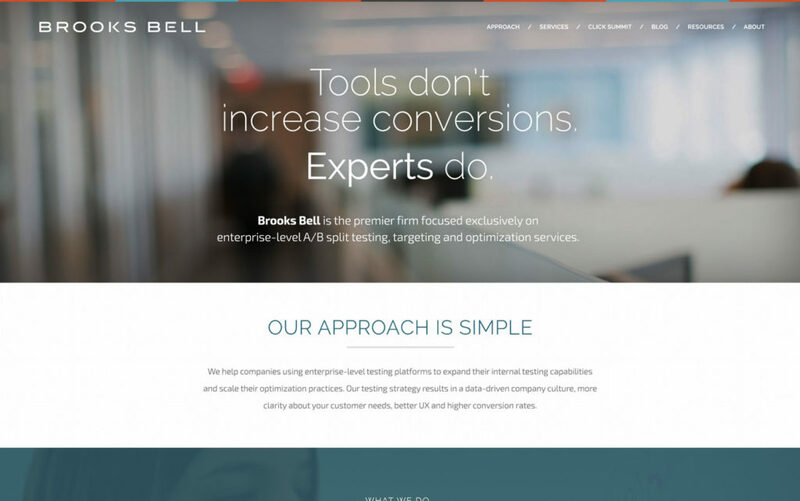 Brooks Bell helps consumer organizations profit from A/B testing and they’ve worked with some of the world’s top brands including Toys R Us, Brooks Brothers (no relation), Marriott, Adobe, and AOL. 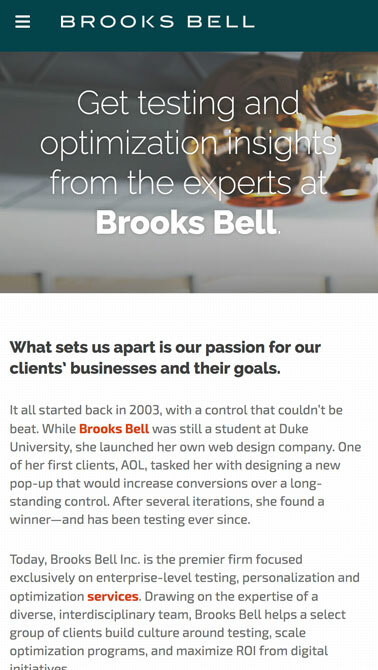 Upon our first meeting with the team at Brooks Bell, we knew we wanted to partner with them. And the feeling was mutual. Brooks Bell has quite the portfolio of impressive brands. They wanted to do something that was timeless, showed off their core strengths, looked great across all devices, and would give them a valuable marketing tool to take to the various conferences they attend annually. Inspired by top consumer fashion brands, Brooks Bell wanted the website to give a high end feeling to their agency. Equipped with exemplary photography of their incredible office space in Downtown Raleigh, we set off to create something timeless and beautiful. We were immediately energized by the forward-thinking attitude of their marketing arm. We knew we had a grand opportunity to do something special. Equipped with exemplary photography of their incredible office space in Downtown Raleigh, we set off to create something timeless and beautiful. Highly visual, full panel backgrounds are certainly the modern trend in web design. With increasing Internet speeds and a desire to bring a magazine style product to the web, we set out to not just throw some pretty photos on a website, but have those photos bring out the content and showcase Brooks Bell’s amazing service offering. And we did just that. We paid careful attention to Information Architecture and added a healthy dose of respect for the photography and resisted the urge to overdo it. Responsive Web Design was a core feature as a part of our proposal to Brooks Bell. Since the firm routinely travels to conferences across the country, they wanted a website that would not just render across tablet and smartphones, but look engaging and beautiful at the same time. They wanted their website to be a powerful sales tool on the conference floors as well as on the laptops of the CEOs who would receive their bids. And we delivered just that. The website is beautifully responsive across all styles and viewports. Drupal was a dirty word around the Brooks Bell office. They wanted to go with a backend like WordPress that was seamless and easy enough for the most novice of users to jump in and create content. We successfully managed a migration of their wealth of blog posts over to the new site and gave them the keys to continue adding content – but on a more user friendly platform. 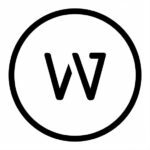 The firm used HubSpot as their marketing automation tool of choice and we married HubSpot beautifully with WordPress making data synchronization a cinch.